The visualization of regulatory networks is becoming increasingly important in order to understand molecular mechanisms and diseases. 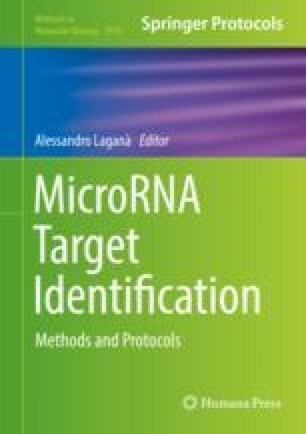 MicroRNAs (miRNAs) are small noncoding RNAs (ncRNAs) responsible of the post-transcriptional regulation of messenger RNAs (mRNAs) and other ncRNAs. MiRNAs are involved in numerous biological processes including development, cell proliferation, and apoptosis. They are also key molecules in major complex diseases such as cancer and cardiovascular diseases. A single miRNA can regulate many targets, making the analysis and visualization of these complex networks challenging. Here, we present standard and advanced visualization approaches to represent networks with a special focus on miRNA–target interactions. Francesco Russo and Jessica Xin Hu contributed equally to this chapter. The authors would like to acknowledge funding from the Novo Nordisk Foundation (grant agreement NNF14CC0001).